So, back to our favourite subject. Last week I asked what a science fiction novel would look like if it could "think the totality of what it projects". That is, in the words of Blanchot scholar Michael Holland, "total transcendence in the here and now". To my surprise, not one comment arrived despite the frenzy when sci-fi was discussed elsewhere. Anyway, my own answer was "Literary fiction". This needs clarification. By literary fiction, I don't mean the kind of books you see on the Man Booker Prize shortlist. It is unfortunate that these frequently very conservative novels are classed as literary fiction when really they are part only of the calcification called Establishment Literary Fiction. Genuine literary fiction escapes genre, including its own. Now "escapes" needs clarification. What makes a novel like The Road different, however, is its attempt to think of the totality of what it projects. In this case, the apocalypse has destroyed narrative as much as it has destroyed the landscape. Very little remains. The father and son seek a future as the reader seeks narrative comfort. My doubts about some passages in the book point towards where McCarthy loses conviction. Perhaps this is an inevitable failure. Beckett's post-apocalyptic Endgame, however, is an example of where the author's nerve never falters. Does it say something that sci-fi fans have never tried to adopt this play as their own? This is the trouble with the debate. Genre fans, such as those mentioned above, seem to be drawn to the specific features of genre: the technological changes of the future, space travel, the particulars of forensic science, the horror in Horror, homo-eroticism in Westerns, and when they appear in fiction called Literary, they can't see the distinction. Hence Wikipedia's indignant summary of the perceived differences. Yes, Crime & Punishment is a psychological thriller but that does not mean that the latest hackwork with a disturbed young male protagonist is Crime & Punishment. Fortunately, Dostoevsky's book doesn't need to be saved from such readers. But others do. I have tried to save Richard Ford's trilogy from the Establishment Literary Fiction label by writing an essay on it. Tao Lin's Eeeee Eee Eeee needed to be saved from Cult Fiction, so I wrote a long review, while Roubaud's The Great Fire of London needed to be recovered from the Hypertext fiction basket and David Markson's This is Not a Novel from its solitude. I'm as open to genre as I am indifferent. For instance, I would like to help Nick Tosches' In the Hand of Dante up the purgatorial mountain of Crime fiction, but I need to re-read it. Save to say here, the ostensible "Crime fiction" chapters of the book are what helps it to escape the pile. No doubt some of you will think I have missed many others. Persuade me. Good to see the return of Entitled Opinions, Stanford University's podcast with Robert Pogue Harrison in the chair. It starts off with Philippe Buc discussing "Religion and Violence". As Buc is an expert in "religion and power in pre-modern western Europe, principally from Late Antiquity to the High Middle Ages" we can expect an awareness of the longue-durée, which is nice. Next week, Orhan Pamuk visits. And if you haven't already noticed, don't miss the new link I've added below under More Literary Blogs to Jonathan Swift's new blog Journal to Stella. OK, it's 298 years late but Ireland didn't have an internet connection until last week. Maybe. Last year the £5,000 prize for "best first collection" went to another Picador poet, John Stammers (a product of Donaghy's poetry workshops), and the £1,000 “best single poem“ prize was given to Ian Duhig for a poem - you guessed it - from his forthcoming Picador collection. The same poem earlier won Duhig the £5,000 top prize in the Poetry Society's national poetry competition, judged by a three-man panel including his mate Don Paterson, the foul-mouthed Scottish bard who also happens to be the poetry editor at, er, Picador. This year's five-poet Forward shortlist includes two other chums, David Harsent and John Fuller (winner of the Forward prize in 1996, when one of the judges was again Sean O'Brien). And Sean O'Brazen was one of three judges of the 1997 T. S. Eliot prize (worth £5,000), which was awarded to ... his own editor, Don Paterson. Duhig, Donaghy, O'Brien, Harsent and Paterson all have the same agent, TriplePa, aka Gerry Wardle - who just happens to be Sean O'Brien's partner. And Donaghy, Duhig, Farley, Fuller, Harsent, Paterson and Porter have all received fulsome write-ups from the Sunday Times's main poetry critic, one Sean O'Brien. And guess who chaired the judging panel this time! Now, I am aware of the difficulty of avoiding apparent favouritism in literary Britain. It is such a small world. For instance, it's unlikely I would have posted this if Picador was in the habit of sending me free books. Even one. And I'm also aware of the philistine cynicism of Private Eye's famous editor, TV's Ian Hislop. Did his organ have anything to say about the remarkable good fortune of his wife's first novel - a romantic potboiler - getting picked for Richard & Judy's Book Club and then scooping the "Best Newcomer" prize at the 2007 British Book Awards? However, despite all this, the problem with literary Britain is not the incestuousness of awards but the value placed on them. It's almost certainly the same in the US. I was going to say literary awards have replaced criticism as the basis of judgment because the latter has lost its authority, except "replaced" and "lost" suggest that it was ever any different. So, in order to recover from the crippling suspicion and inanity of prize-giving, we need a critical revolution. We need to save poetry and novels from their award-winning misfortune! This might happen when a review-essay carries more authority than the compromises of a prize committee often made up, in the case of literary novel awards, of celebs and middlebrow media whores. This means we need more young writers with the long-sight and patience of, for example, James Wood (how ever you might disagree with him). The fact that I'm struggling now to think of more names to people this vanguard is evidence enough of its necessity. Any suggestions (present company excepted)? So, Ian McEwan isn't keen on the "road-rage" tone of blogs and "the threads that come out of any given piece of journalism" (what ever that means). It seems that when people know they can't be held accountable, when they don't have eye contact, it seems to bring out a rather nasty, truculent, aggressive edge that I think slightly doesn't belong in the world of book reviewing. (Mmm, that string of adjectives reminds me of another). I'm as perplexed with this as The Literary Saloon is. Many blogs allow comments from readers precisely to generate the accountability of feedback, and there's about as much eye contact with its subject in print reviewing as there is in blogging. Also, it's ironic that he contrasts his dislike of blogs with his admiration for Arts & Letters Daily. I gave up on that page several years ago because of its bigoted and philistine tone. Would he feel any different about the site had it linked as regularly (or even once) to one of our best literary blogs - now sadly retired - as it did to shrill neo-liberal propaganda? For of course, The Sharp Side was very good at holding McEwan to account for his actions. Among other revelations, it exposed his dining arrangements on the day tens of thousands of his fellow countrymen tried to hold their representatives to account for a criminal war or two, as well as providing a remarkable 5,500 word analysis of the politics of his most notorious novel. The loss of Ellis' voice is regrettable for his incisive blogs on our foremost Establishment Literary Fictioner alone. Yet his retirement from blogging helps to emphasise from where blogging emerges: not from the necessity of making a living, or from an attempt to gain attention at any cost, but from passion and expertise in various fields; something that has to be done alongside another full-time life. It's no surprise that many give up. The only reward, it seems, is friendship. Despite all this, I tend to share McEwan ideals about resisting the "nasty, truculent, aggressive edge" in book reviewing. Only a few novels really deserve it. Yet with Sir Howard Davies' comments about book reviewing culture still resounding, I wonder if it might benefit rather than ruin the literary culture in this country. Think of the influence of the UK's most popular film reviewer. So many people listen to Mark Kermode on Simon Mayo's radio show precisely because of his quirky passion. Metafilter discussed his famous rant about Pirates of the Caribbean just last week. It's an indication of the hang-ups media folk have about literature that the literary equivalent - Mayo's Book Panel - does not have an expert reviewer but opinions from "members of the public". Last week, I even saw two actors giving their worthless judgments on Richard & Judy's Book Club! In order to bring Literature to the masses, it seems they feel the need to remove any offending literary content (as Joyce Carol Oates observed). The more bland and wet one is, the better. Yet of course, they want all the perceived cultural benefits of literary appreciation. If Kermode decided to transfer his expertise to books, we'd probably never hear from him again. But we do need such a reviewer. Of course, I'd be willing to take on this heroic role, so long as I didn't have to read the god-awful books on their reading lists. Three Percent, Conversational Reading, Bookninja and The Literary Saloon. All these top literary blogs have recently linked to reports of literary censorship in Iran. I'm sure many more have too. Of course, it demonstrates the concern literary bloggers have for the necessity of freedom of speech for a thriving literary culture. And no doubt the flurry was prompted by The Observer's report. But why Iran? You won't struggle to find stories of censorship and worse in another Islamic country over which we have a greater responsibility and influence, but it has nothing like the same media profile. Again, why? Medialens' latest alert following the exemplary career of journalist David Aaronovitch helps to answer. It reveals in painful detail the drip-drip impact of mainstream journalism on the consensus. Prior to major acts of aggression, Aaronovitch has been there to raise concerns about what is happening in Kosovo, Afghanistan and Iraq. It's done wonders for his career. Since then, along with Nick Cohen, he's attacked, among others, Hugo Chávez of Venezuela. He's now concerned about what is happening in Iran. While I'm sure not one literary blogger I've mentioned backs the threats of violence made by the US administration, the willingness to promote this story uncritically has unwelcome consequences. It has already become a discussion point: "Should we bomb Iran?" etc. And if the answer is yes, no doubt those who find the moderate course in whatever society they belong will be able to mitigate their anxiety with the hope that Iranians will be free at last to read The Da Vinci Code. Another example of the drip-drip comes in this week's TLS. With stunning relevance for what's happening in the world, Edmund Bosworth reviews Islamic Imperialism (not online) which argues that the 9/11 attacks had "little to do with U.S. international behavior or policy in the Middle East". First World War British officialdom, persuaded by advocates of the Arab cause like TE Lawrence, were taken in by the grandiose claims of the Sahrif Husayn ... to express the real will and aspirations of all Arabs in greater Syria and Iraq. largely directed against the United States (the book was presumably written before the London Tube bombings of 2005), but this is only because America's position as a pre-eminent world power blocks Arab and Islamic imperialist aspirations. If America and Israel disappeared off the map instantly, the attitudes would still be there, albeit with newly found specific targets. So the US needs to invade and occupy countries for years on end in a totally non-imperialist way in order to protect the world from Islamic imperialism, and any resistance is an expression of Islam's latent imperialism? Bosworth is for good reason a professor of Arabic Studies and not elementary logic. Isn't the reason why the US is a pre-eminent power a major factor in what is happening the Middle East? That is, wouldn't it disappear tomorrow if there was no oil to be found there? Bosworth admits that Karsh's analysis "will not convince Western liberals with minds fixated on their own guilt, let alone any Muslims". Well, I should hope not, though I do admit I am fixated on the issue of guilt. But it's not guilt I feel. What I feel very strongly is shame and anger that I share this freedom with those for whom professional servility to power takes precedence over the deaths of over a million people, which are not only unmentionable but apparently irrelevant. Or maybe this review was written before any of that happened. My house ... I love it. When I earned my first money by selling Frost to the Suhrkamp Verlag, I bought it. I work from 5 in the morning until 9 o'clock. Then I take a walk, read the paper, enjoy doing nothing, enjoy the sun, the blue sky, the mountains and all of a sudden people are wonderful. I have lunch. I write again from 4 to 7 o clock. I take a walk, and then it's time for dinner. That's my life. In 2006, I linked to Christiaan Tonnis' short video of his visit to Thomas Bernhard's house. He's now produced a MySpace page (from which the above quotations come) dedicated to Bernhard in which every picture is from a story or a scene in his autobiography. The theme of the page, he says, is Bernhard's motto: In the darkness everything becomes clear. Be warned that it is public for only ten days or so. 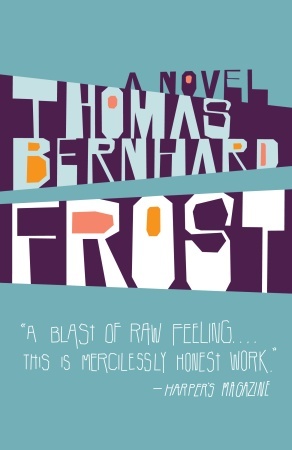 However, don't forget also that Bernhard's wondrously oppressive first novel is published in paperback this month by Knopf. Nigel Beale picks up on the question "Why do most endings of novels disappoint?" apparently asked by James Wood in How Fiction Works, his "first full-length book of criticism" (and also his first with an undistinguished title - it's not very long since John Mullan published How Novels Work). It's a good question. I never reach the final page of a novel without already having finished it. The final page is always superfluous. I mitigate disappointment with selective forgetting. The endings of my favoured novels have barely any presence in memory compared to their beginnings. But I only read for beginnings anyway. How can there be an end to what only ever begins? Reminded by Sam Jordison's blog on science-fiction (including grumpy comments by moi prompted not by SF but the evidence-free abuse of literary critics), I returned to Michael Holland's very short essay on the subject in Nowhere Without No, a collection of memorial essays dedicated to Blanchot. I'm often drawn back to these 600 words, so let me try to work out here what I think they're telling me. It begins by linking a famous passage from The Writing of the Disaster in which Blanchot addresses his post-mortem readers: You who live later, close to a heart that no longer beats, suppose, just suppose… with the appeal of science fiction (emboldened words stand for italics in the original). Science fiction ... offers the prospect of a later age where human life continues beyond the death of the body: an era when theology has given way to technology, and the original Undead - the vampire - has mutated into the average space hero. There are thus no tombs in the sci-fi world, and with them disappears the border they police between the here and now and the beyond. The beyond is the here and now for the space hero. No part of the universe is out of bounds, all time is accessible in the instant, transcendance has become the everyday. I'm expecting SF experts to dispute this definition, so to answer them in advance, I think the existence of tombs in a particular novel shouldn't mean Holland is wrong and doesn't understand the genre. Think of this as a characterisation of SF as the extremest fiction. Whereas ordinary fiction is constrained by the fact of death, SF stands for the transcendently-free imagination. In this sense, Sam is right to called SF "one of the defining literatures of the last century" but wrong to limit it so. It is the defining form itself: fiction par excellence. OK, now see how that fits. The appeal of sci-fi lies in its ability to bring us into a sort of intimacy with the humanity of the future, freed from the trauma and mourning of the end of theology thanks to the capacity to live later which it owes to technology. Sci-fi thus satisfies an urgent need, during our age of transition, to be assured of some human continuity from one era to the other, and reassured that, unlike the vampire, the undead who people the techno-world will not be agents of evil and terror. Again, we can thereby think of SF as the epitome of fiction in general, in this case our personal, post-religious need for hope and self-help: a coming to terms with life, our own transitional age. Holland, however, sees a problem for fiction here. But seen from the future it anticipates, sci-fi will inevitably appear as primitive myth. For like all myth, it hangs back from thinking the totality of what it projects - which is to say, total transcendence in the here and now (whose reality will, for the first time ever, make myth itself a thing of the past). The unthinkable reality of that transcendence is violence. The only way transcendence can remain transcendence once it becomes real (free of myth) is by incorporating within itself a capacity for violent destruction without limit (which for the theological era was equivalent to absolute evil) considered as no more than a dimension of the everyday. The “human” condition of possibility for this is the ability of human subjects to live on, beyond physical destruction. But its implications for human subjectivity remain unexplored. Though the sci-fi hero is always already dead, living later, essentially a late being seen from our present standpoint, sci-fi narratives are spoken by and to a subject for whom that mode of existence remains totally unthinkable. In sci-fi the violence of transcendence is deflected so that the world and only the world (which includes the bodily reality of the individuals who inhabit it) is exposed to transcendence as violence. Sci-fi is thus essentially nihilistic. It frees the reality of transcendence from the demonization by theology, but merely invites us to contemplate it in the form of endless technological apocalypse. The reason why I'm drawn back (given that much of it probably escapes me) to this is because, again, it can be applied to fiction in general. The writers of fiction I champion tend to follow the logic of their inspiration, the implications it has for the work's form and content. In this way genre distinctions are rendered irrelevant - which might explain why Sam thinks SF novels are not called SF novels when they wins literary prizes, though I'm not confident that prize committees do it for this reason. So what would SF read like if it undertook Holland's challenge? My answer: literary fiction. Holland's final words offer his own answer, an appropriate one for the volume in which it appears. Where can our age of transition turn if it is to think and anticipate what it will be to "live later"? Re-read Blanchot’s fiction, re-read until you can read. Later is not now, it always was. "You who live later" was and is us; the "heart that no longer beats", always our own. Live later, before it is too late. And despite the profound and unsettling discoveries of modernism and post-modernism, and everything they show us about the unreliability of the narrator and the fallacy of omniscience, some of us still, when we read, are happy to accept that the narrative voice has the right to comment on a character, whether tartly or sympathetically, and the ability to go into that character's mind and tell us what's going on there. Says Philip Pullman in The Guardian (link via Ward Six). Despite the article being blog-short, he identifies what I suspect is the most decisive yet unacknowledged distinction in contemporary literature: those for whom literature is defined by this right - let's call it Pullman's Right - and those who recognise no such thing. I'll come back to this, but Pullman's affirmation comes at the end of a discussion of the differences so-called between story and literature which is instructive in itself. It helps me to explain why I think Establishment Literary Fiction is as artistically flawed as the genre fiction to which it is supposedly superior. Pullman uses an example from His Dark Materials to define literature as the ability to convey, by means of a metaphor, his character Lyra's unspoken feelings. If the image of the dark house coming to life works on the page, it's precisely because we know it's an image: we know it's what Lyra feels like inside, even though all we'd see if we looked at her would be a girl sitting still. To film it would be absurd. There's no arguing with that. But I would also claim that writing it is also absurd. I would instead define literature as that which brings to life the distance between the reader and Lyra. This would challenge the imagination rather than take its place. As a reader, I find this far more exhilarating; more so than characterisation, plot or prose style. Aharon Appelfeld's most recent novel is a good example of how one writer achieves this. In his podcast interview with Philip Pullman, John Mullan begins by saying he's pleased to be able give attention to "a children's book so-called" that normally gets saved for "supposedly adult literary fiction". Yet if the distinction is false as he implies, it's not because children's books are literature but that most adult literature has not grown up; it still appeals to solipsistic wish-fulfilment. By the way, this lack of distinction also justifies the epidemic frustration and critical contempt for the cultural advancement of fancy prose over the murderous. For this reason, we need to turn critical attention to the ethical dynamic of fiction; not for ethical reasons, mind, but artistic. Do we ever stop to wonder how extraordinary it is that a disembodied voice can seem to tell us what is happening in someone's mind? We are as forlorn as children lost in the woods. When you stand in front of me and look at me, what do you know of the griefs that are in me and what do I know of yours? And if I were to cast myself down before you and weep and tell you, what more would you know about me than you know about hell when someone tells you it is hot and dreadful? For that reason alone we human beings ought to stand before one another as reverently, as reflectively, as lovingly, as we would before the entrance to hell.